There are several options to utilize print advertising for your marketing message, booth announcements, special event/satellite symposia invitations, employment opportunities, etc. at Nutrition 2019. 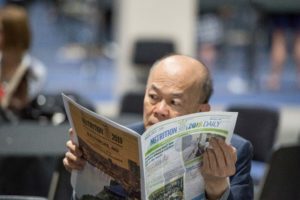 Nutrition 2019 Daily is a full-sized tabloid newspaper published during ASN’s annual meeting and distributred to meeting attendees onsite. Advertise in Nutrition 2019 Daily to increase your company’s visibility to scientists, clinicians, and prospective new hires! Nutrition 2019 Daily will also include an exhibitor guide to help attendees navigate The Hub. Descriptions of each exhibitor as well as their products and services will be featured. Please contact our publisher Custom NEWS, 800-627-8723 for more information and to book an advertisement. Distributed to every attendee, the Program-At-A-Glance contains high-level information for the meeting, including a schedule of events, session listings and meeting room locations. Take your message directly to attendees by placing your company pre-printed flyer in each conference tote bag. Have your company’s preprinted literature or product sample delivered to each attendee’s hotel room. An additional hotel fee per room will apply.